Date: Sunday, Nov 11 Time: 7:30 - 8:30 a.m. (Registration) 8:30 a.m. - 2 p.m. Location: AB Ballrooms 105/106 - For all sessions except afternoon session options (see below for more details). 4-H Family Day promises to be jam-packed with activities that will provide 4-Hers and their families with opportunities to learn new skills, meet new people, and check out all of the other great programs offered at Farmfair International. Submission form for 2019 is now open! Deadline to apply is May 31, 2019. Since its launch in 1969, the BMO Farm Family Awards program, has recognized outstanding Farm Families who are dedicated to their farms and communities. Family Days is a popular event at Farmfair designed to give little ones more to enjoy out of the entire experience with kid-friendly programs. See the latest leaderboard and join the live online gaming tournament of Farmers 2050! Food Lab is a free event that will feature two daily sessions of hands-on food workshops throughout Farmfair International. Registration is FREE with your admission to Farmfair International. We are pleased to partner with the Edmonton Area Rabbit Society (E.A.R.S) to host their Rabbit Show on Saturday and Sunday! 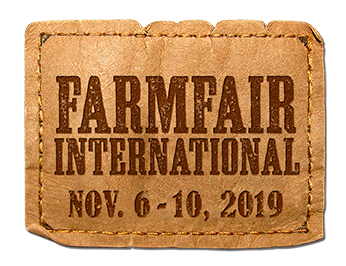 Need to relax during Farmfair International? Head to the Roadhouse in Hall E! Starting at 9 p.m., Thursday to Saturday, there will be live music performances. Whether you are looking for a new business opportunity on a small holding, expanding an existing herd or looking at integrating another species into your operations to better manage your resources, our program will be of interest to you.